Move the Size slider to change the size of the cross and move the slider alpha to the extreme right to transform the figure. The applet above is an example of a dissection puzzle. A dissection puzzle, also called a transformation puzzle tiling puzzle where a set of pieces can be assembled in different ways to produce two or more distinct geometric shapes (Wikipedia). 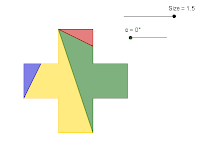 The cross to isosceles triangle dissection puzzle above was created by Henry Dudeney in 1897.
hey there! i'm acutely aware that's form of off-subject matter, but i'd plan i'd raise. Is it possible to be turning over replacement links or maybe person authoring a publish or vice-versa? My web log clariwirelesses most of constant troubles as yours, and that i do trust we tend to ar during a operate to wi-fi enjoy the benewiwireless related to each totally different. if you're in fact interested, feel liberated to apply Maine AN 1ec5f5ec77c51a968271b2ca9862907d. I anticipate reading from you! wi-first rate web log by the way! When did NEET exam start? How do I apply for NEET Form 2018? What is the date of NEET exam 2019? Will there be re NEET 2018? If you do not know how to do your homework you can always order it at https://anassignmenthelp.com/ site.